Do you throw away your cereal boxes? Don’t throw them anymore. 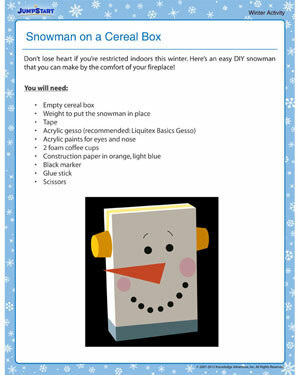 Store a few cereal boxes and help your kids make the most amazing cereal box snowman ever! Download our free winter activity printable and help kids explore their creative sides. The winter activity printable requires very minimum and basic art supplies and will be an engaging winter activity for kids! Browse more activity printables for kids online.